Gamers waiting to get an invitation from Epic Games to try out 'Fortnite' on their iPhone or iPad can gain access early via other players, with current participants receiving emails advising them of the availability of friend invitations on their accounts. 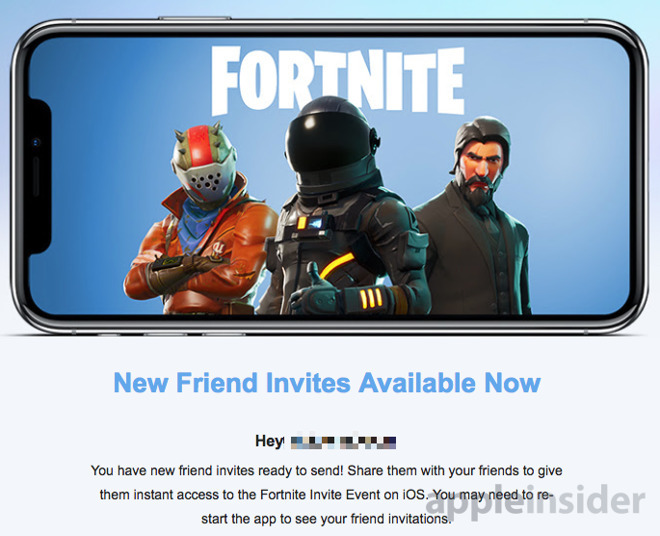 The email from Epic Games tells existing Fortnite players of an invitation link in their accounts that they can share with their friends, allowing them access to the current "Fortnite Invite Event on iOS." At the launch of the event one week ago, Epic hinted that players will receive invitations to allow their friends to play the game. Current players wishing to invite their friends can access a new "Friend Invite" button when they log into the game. The game will then offer another button to share the invitation link to friends, with each link only able to be redeemed once. Epic is still keeping the email-based invitation process open, but the sharable invitation link will allow those waiting to take part a way to jump the queue, instead of waiting for Epic to open up more capacity on the game's servers for more players. Fortnite on iOS requires at least an iPhone 6S or iPhone SE, an iPad Mini 4, an iPad Pro, iPad Air 2, iPar 2017, or later hardware, running iOS 11 or later. The iOS port of the popular PC, Mac, Xbox One, and Playstation 4 game retains practically all of the elements of the other released versions. A stylized open-world shooter, "Battle Royale" mode in Fortnite is a 100-player single-elimination deathmatch, where individuals or teams take each other on across a large map to be the last player or group standing. Starting with minimal items, players must quickly parachute down from the flying Battle Bus to the island and acquire weapons and resources, the latter able to be used to build structures as cover and to raise the player's elevation to better see opponents. AppleInsider will have a full hands-on for Fortnite soon.